What better way to begin the holiday-shopping season than filling up your cargo compartment with as much stuff as you can? 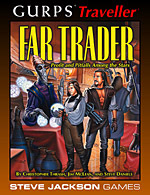 In that spirit, we present GURPS Traveller Classic: Far Trader, newly released to e23. This supplement is a galactic bargain of goodies, with rules for developing trade routes, making contacts, running commercial starships, and more. Whether you're beginning your life as an independent trader among the stars or augmenting a Traveller campaign with some lucrative side interests, GURPS Traveller Classic: Far Trader is your one-stop shop.